ErgoMed Products, Patient care slings, medical supplies, patient lifts, lift slings, hoyer lifts, sit-to-stand lifts, lifts. ErgoMed Products was started in June of 2002 to supply a quality product for a fair price. The main goal of Ergomed is to be a one stop shop for all your patient sling needs, keeping in mind that every facility has their own unique needs when it comes to patient handling. We make every effort to supply the highest quality product because we know how important it is to make sure your residents are safe and comfortable. With that said, we want every customer to feel that they can rely on Ergomed for all their sling needs. 100% Satisfaction or your money back. 1. All of our slings are made in the U.S.A.
2. Our slings are made with anti-microbial fabric which prevent bacterial growth as well as soil release which is much like Scotch Guard. 3. 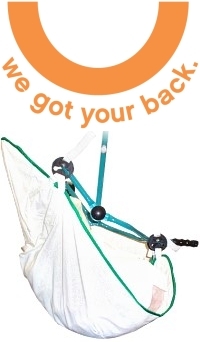 Most of our slings are equipped with a rear handle to assist in positioning. 4. Best of all, our slings will cost you 20% to 50% less.